Military press | So You Wanna Get Jacked? Nothing tops of an upper body, nicer than a set of defined shoulders. On both men and women, defined shoulders compliment the rest of the upper body and also play an important role in daily functionality. Have a read into the anatomy of shoulders and built them to your liking! 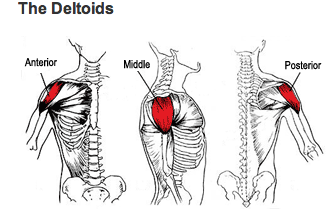 The muscle that we know as the shoulders are actually called the deltoids! All three shoulder heads work together to allow the arm to raise away from the midpoint of the body (known as abduction). So when you are standing with your arms to your sides and you raise them to shoulder level, you’re deltoids are engaged and make this possible. The important thing that I want you to remember is that there are 3 heads in the delts! Why is this important? Because each head can be worked with specific exercises, and by combining exercises that work all three heads we can create a workout thats hit the whole delt and build some beautiful tennis ball delts. As with the chest, working out the delt consists of performing push movements. There are movements that we can use to add size and thickness to the delts, and there are also some movements that we use to shape and define the deltoids and really get those striations showing. To really shape and define the delts, we use raises to target the anterior, middle, and posterior heads of the delts. These are isolation movements and really provide a deep burn when done correctly. There we have it everyone! As you can see, the deltoids are one of the smaller muscle groups on the body but they still require attention and targeted training to be built. Well built delts complement a big back and a solid chest, so use the provided exercises to target the delts, destroy them and get jacked. Until next post everyone,stay fit, make healthy choices and kill it!